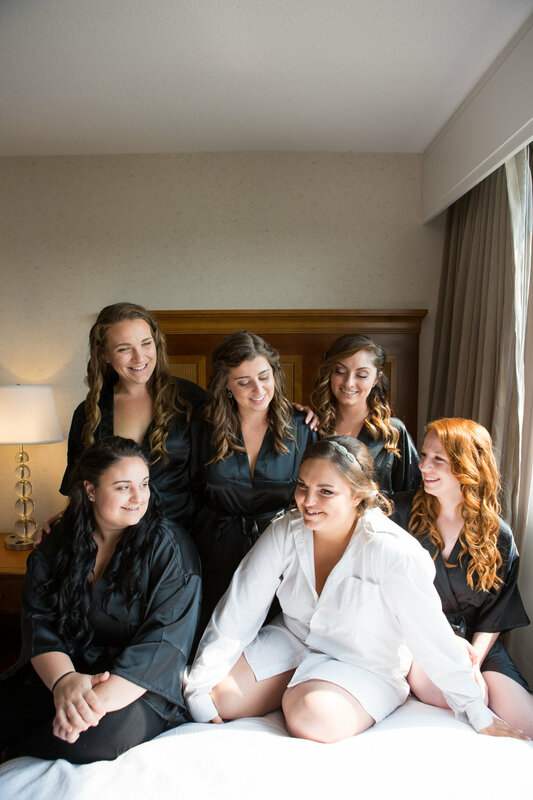 We arrived at the hotel in Bangor to find Morgan and her girls relaxed in their bridal robes. Morgan was in a big comfy chair- facing the best light- while getting her hair and make-up done. All her best girls were finished and entertaining themselves by playing and watching Norah, Jerrod's niece, giggle and tumble on the bed. She was adorable, and loved all the attention- and we loved to photograph her! All of Morgan’s bridesmaids were wearing black robes with their title on the back; Heather had ‘Maid of Honor’ and everyone else had ‘Bridesmaid,’ such a cute idea! And for the first time this year we saw a bride come up with an even more creative idea than a traditional white robe....Morgan herself was wearing one of Jerrod’s white button up shirts instead! 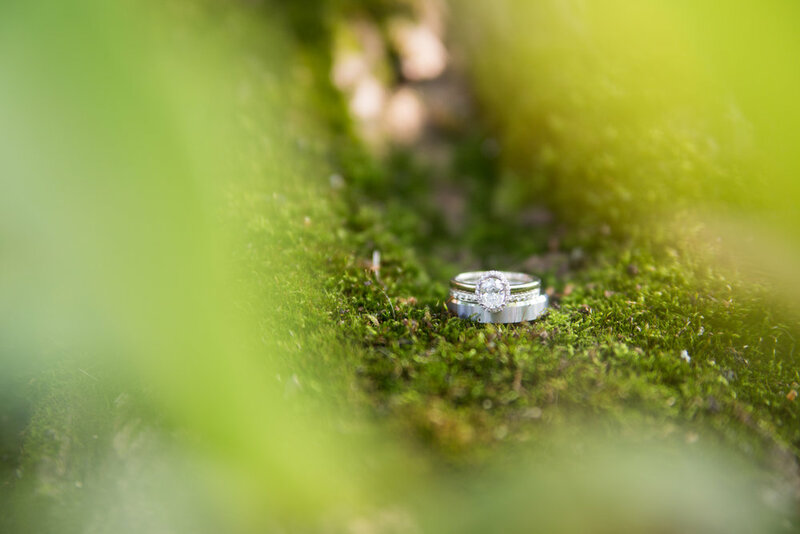 It was an adorable way to keep him close while she prepped for their special day. 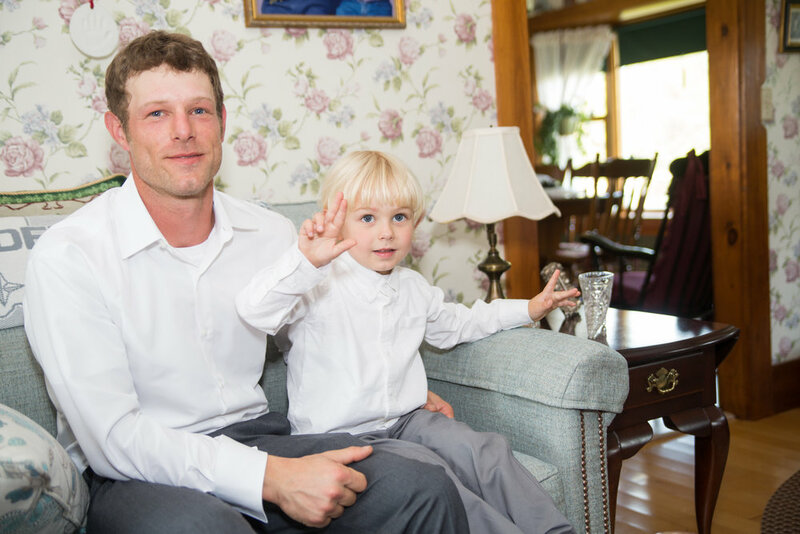 Once all the finishing touches were made and we captured all the fun candids we headed for Jerrod's grandparent's farmhouse. The girls took over one portion of the house and the guys the other. The girl’s set up shop in Jerrod’s grandmother’s hair salon! We absolutely adored this home- everything placed ever so perfectly and neat. It was like being thrown back in time! 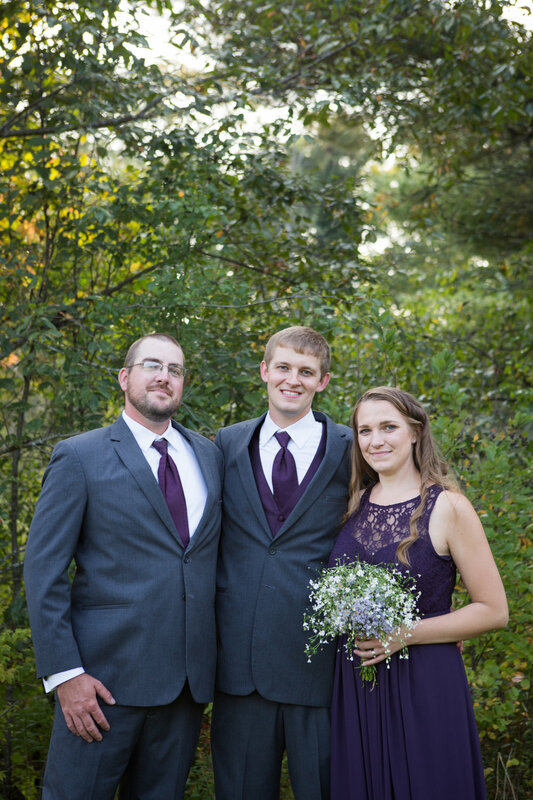 Fun fact: Jerrod’s parents got married on the farmhouse property! Next on our agenda were the detail shots! Armed with Morgan's dress, rings, earrings and a handwritten letter from Jerrod; we set up camp capturing the small things. 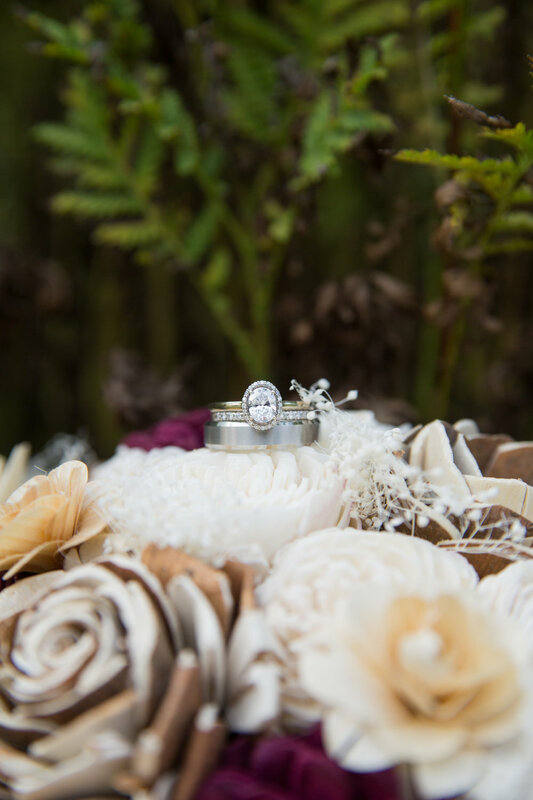 The box holding their wedding bands was handmade with Morgan and Jerrod’s initials and the date 9-16-17. It was a sweet touch to remember their day. 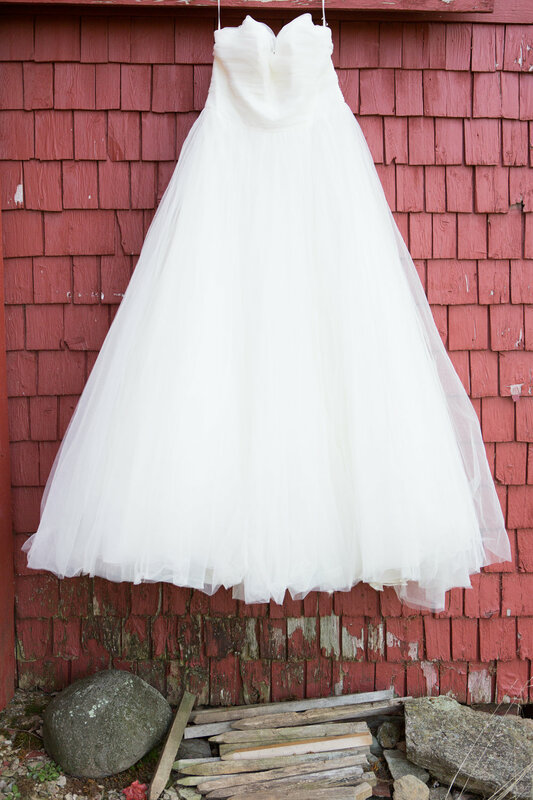 Her dress looked beautiful with the backdrop of the red barn. It made for a great contrast. We had so much land to explore and get creative with! 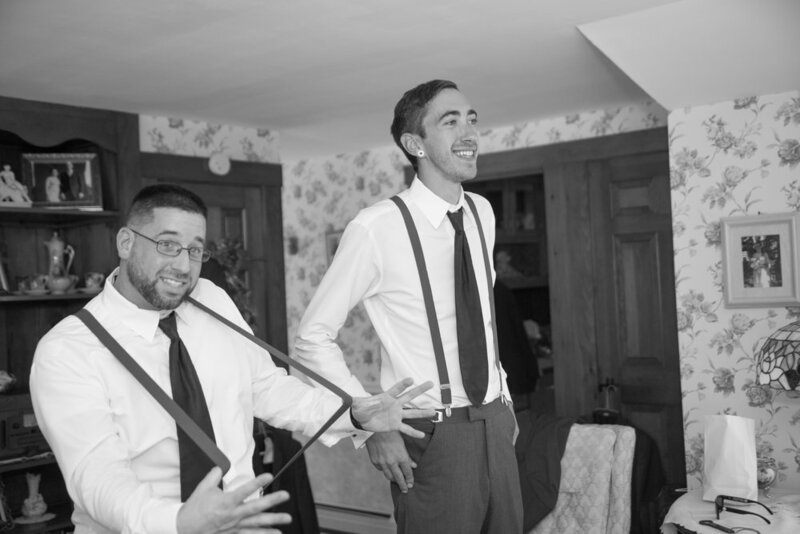 Jerrod and his groomsmen were back inside placing the last touches on their suits before lacing their shoes and heading outside for their formal photoss. The farmhouse, barn and everything in between, offered an abundance of spots to photograph. The guys were laid back & enjoying the day. 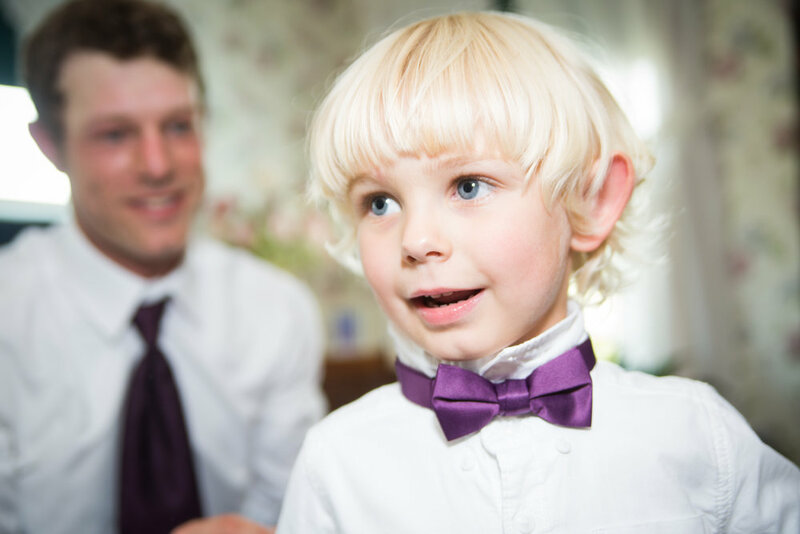 Nolan - the ring bearer- was quick to offer his help and cute smile with every click of the camera. We all agreed that Jerrod was one of the best groom's we have had the honor in photographing this year- so patient and trusting in our craft. It was minutes away from the start of the ceremony! The bridesmaids finished up their formal photos and passed around the champagne bottle for one last celebration drink before walking down the aisle. Guests were seated on handmade wooden benches. 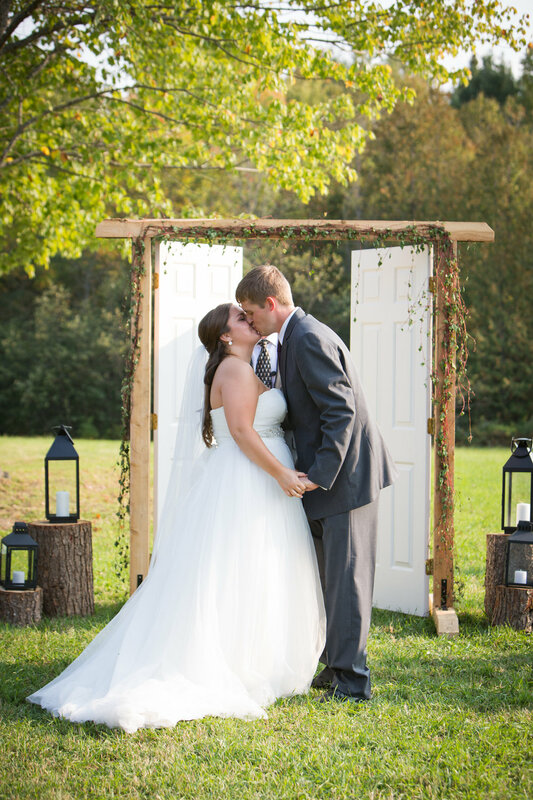 Instead of a traditional arbor there was an open door and frame at the end of the aisle! This was a first for us- loved it! What a unique way to represent a new beginning together! 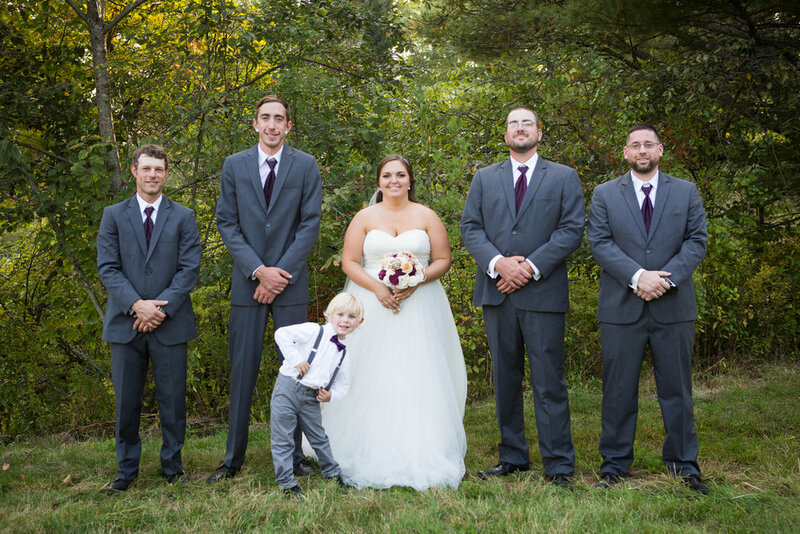 Once all the guests were seated, Jerrod and his groomsmen took their positions by the alter. 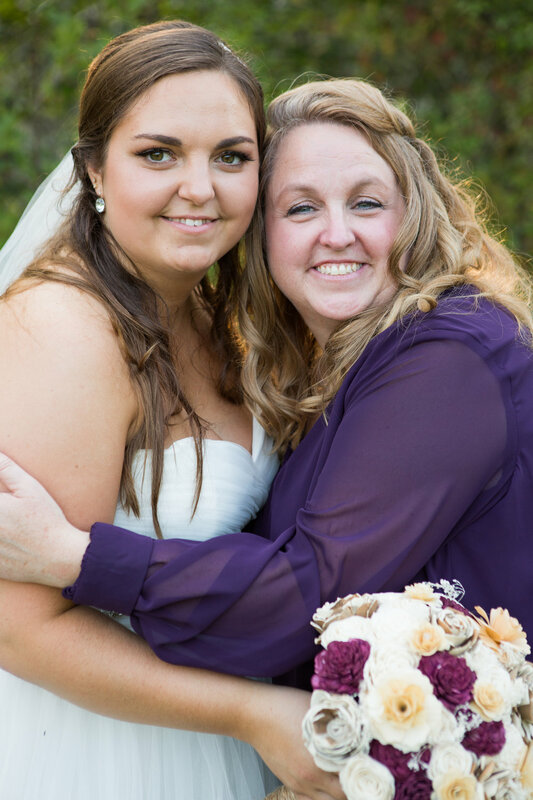 The Maid of Honor and bridesmaids walked up the aisle each giving Jerrod a reassuring smile. Next, Nolan came down the aisle pulling Norah in a wagon. Guests were cooing at the adorable duo. Finally, Morgan and her dad came down the aisle. 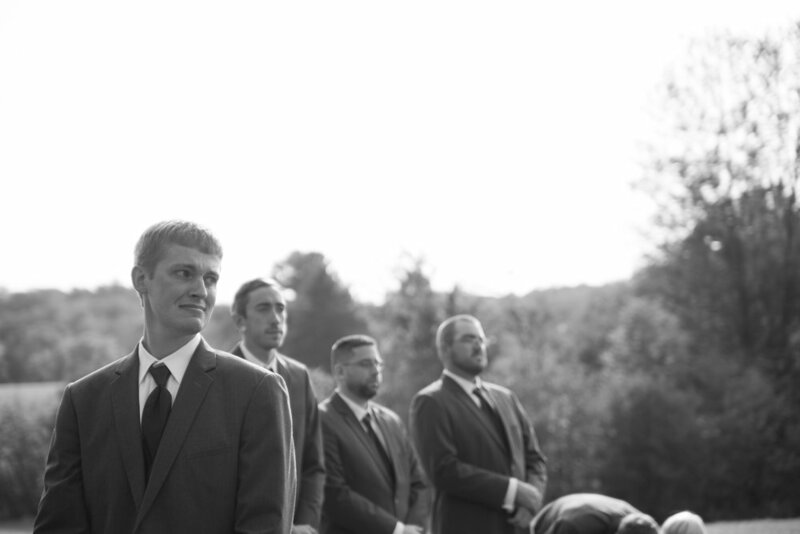 As Jerrod took his first look at his bride, his face lit up. His future wife walking toward him in a beautiful white gown brought him to tears. 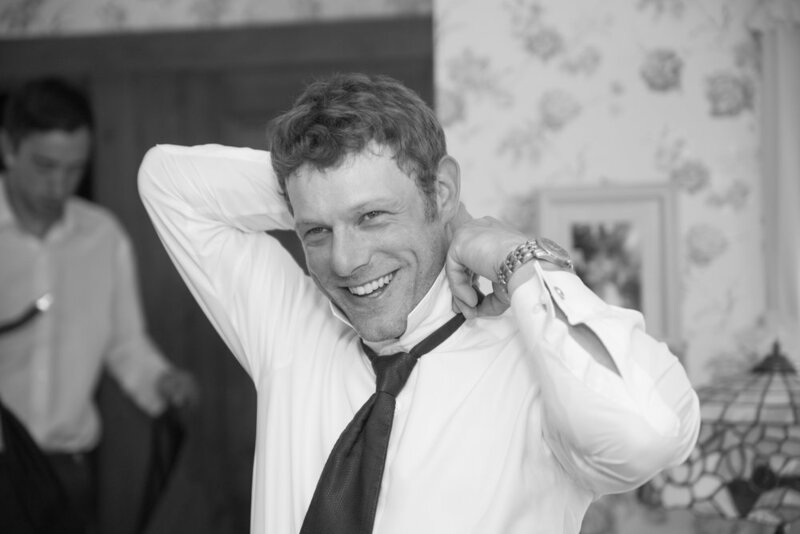 Again, another reason we loved photographing this groom- he wasn't afraid to show his true emotion. Morgan was incredibly beautiful walking towards her groom. Once they were united in front of the door, they immediately grabbed each other's hands. 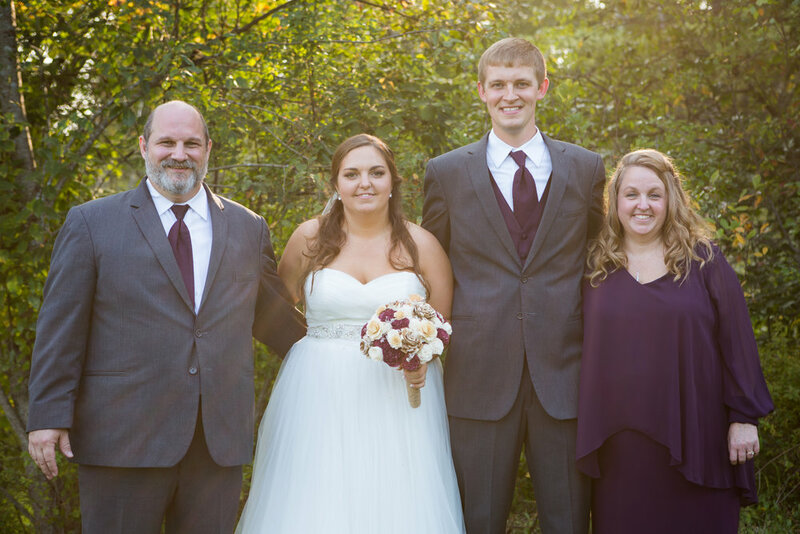 Jerrod and Morgan, along with their family and wedding party, made their way to the edge of the field for formal photos. Everyone in their wedding party was so easy going and fun! They made the process go quickly with their natural laughs and calm nature. Once the wedding party was finished, we moved onto family. Finally, the moment came where we were photographing just the newlyweds -and wow - these two were absolutely adorable with one another. And the light! 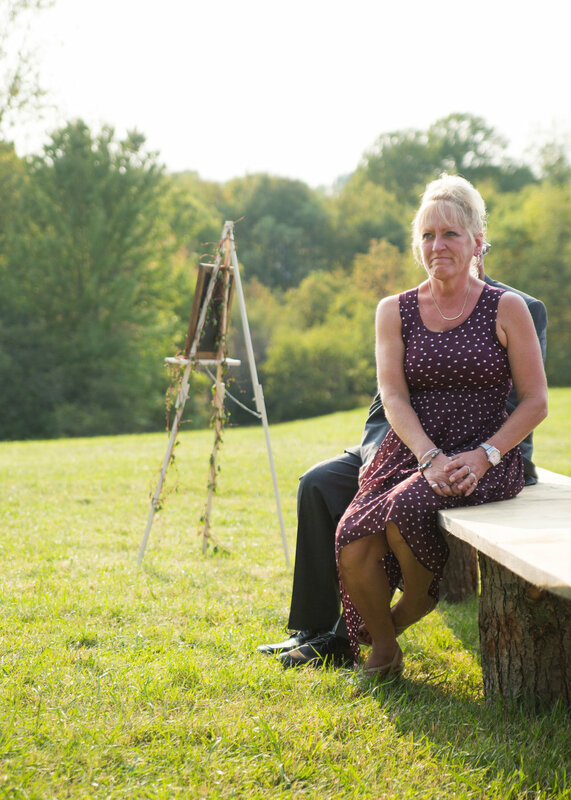 These two couldn't have planned the timing of formal photos any better. Thanks for that you two. 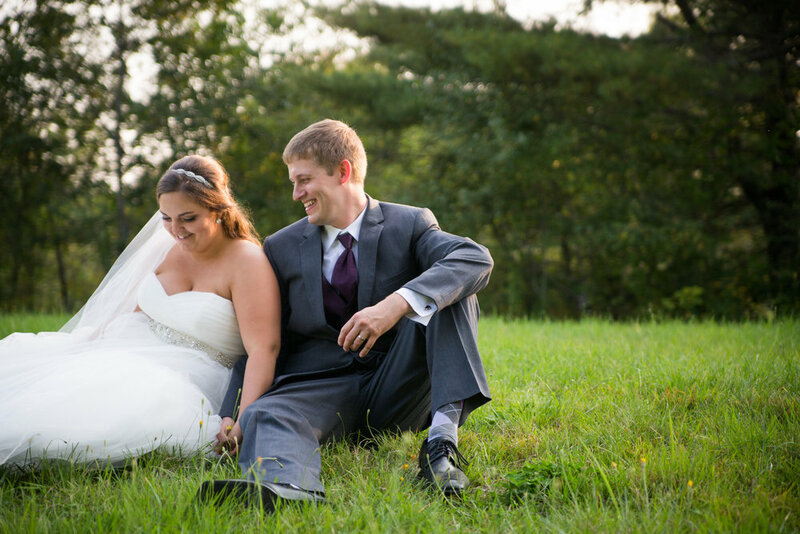 ;) Not only was the golden sun working in our favor, but Jerrod and Morgan were so naturally in tune with one another - it made capturing them wonderful! 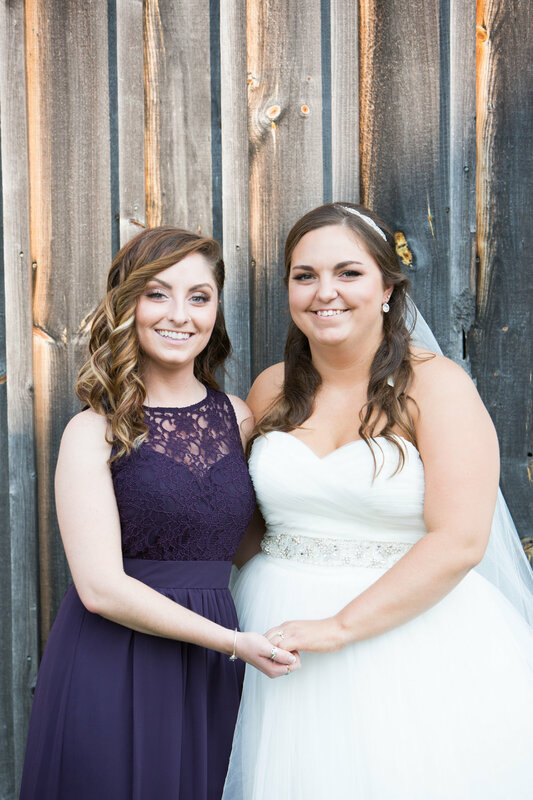 Hannah & Robyn were both so eager to share shots they had taken of the two of them. The time came for the Stanhope’s to to be announced in to their reception. Starting with the wedding party, who danced their way into the large beautifully decorated tent. They headed to their seats for cheering with each new addition to the table. Last but not least Mr. and Mrs. Stanhope were announced into their party! Everyone stood and cheered to welcome them. They made their way to their seats in the center of the table surrounded by their wedding party! The head table was decorated with lush deep greens, flowers and black lanterns. With everyone seated, it was time to give toasts. Heather was up first. She quoted Dr. Seuss, “We are all a little weird and life’s a little weird, and when we find someone whose weirdness is compatible with ours, we join up with them and fall in mutual weirdness and call it love.” She then welcomed Jerrod to their weird family. 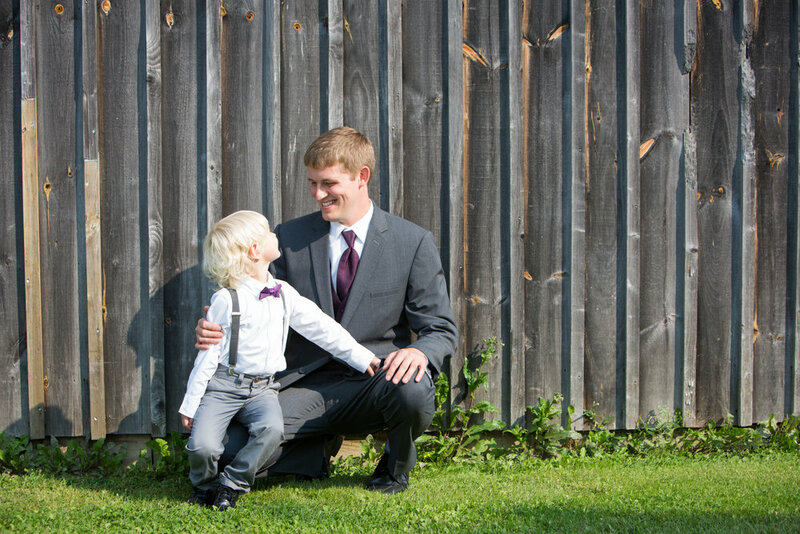 Next, was the best man and cousin, Seth. He spoke about growing up together with Jerrod being the brother he never had. He wished him lots of good memories to come with Morgan. Everyone broke for dinner -delicious BBQ! With the sun setting, we pulled the newlyweds out for more photos. The sun was gorgeous and the couple made the shots even better. They were so in love and it came through with every click of the camera. We also grabbed their wedding party to come join us by the fire pit for some candids. Along with a fire and cozy chairs there were also s’more fixings! It created a perfect late summer ambiance. 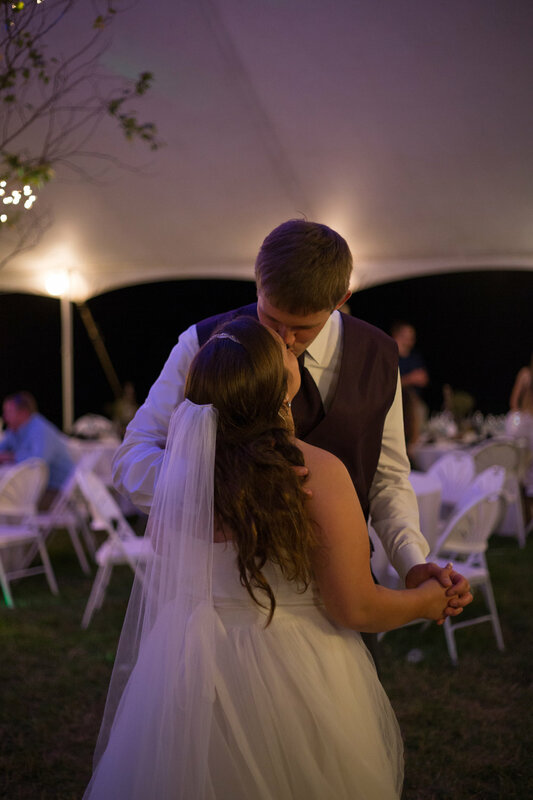 Next it was time for Morgan and Jerrod to share their first dance as husband and wife. They were illuminated by the soft lights hanging from the trees on either side of the dance floor. They spent their dance kissing and smiling at one another. They were radiating such happiness and love- everyone looking on with loving smiles. Morgan and her dad were next on the floor! As the song began, he looked down at his daughter so fondly and proud of her. Jerrod and his mom would take the floor next. Her eyes were full of a mother’s love and happiness for her son. Jerrod and Morgan made their way to their cake. It had a black Mr. and Mrs. topper on the highest point of the three tiers. There were subtle, but lovely flower decorations. The couple sliced into the cake with large smiles, their hands overlapping. They fed each other the small pieces of cake at the same time while sharing a laugh. At one point we all thought that maybe it would turn into a cake smash! But with a gentle touch they playfully pretended. The pair had a few other specials up their sleeve! The dj announced, “if I could quote the great American poet -Beyonce - all the single ladies,” it had guests laughing as the single women hit the floor to try and catch the bouquet. The anniversary dance followed, so many married couples were in attendance. Morgan and Jerrod were the first off the dance floor! The DJ then announced five year intervals all the way to 55 where he then called out 56, 57, 58 until at 62 years of marriage - there was one couple left-and they were Jerrod’s grandparents! What wonderful inspiration! Heather and Seth were called on the dance floor next -it was time for the dollar dance! As guests flocked to the floor to dance with the couple, the maid of honor and best man collected the bills. Guests were having such a blast congratulating and dancing with the new Mr. & Mrs. With such a busy day -the dollar dance was the perfect way to see all their guests and have a little one on one time with each one! They ended their special additions with the shoe game! Armed with their shoe in one hand and their other half’s shoe in the other, they sat back to back ready to play. We came to learn that Jerrod was the first to say “I love you", Morgan is the “Morning Person” of the two, and they both think they’re the better driver! They laughed the whole way through the game even when they disagreed. It was wonderful to see them so happy sharing the little tidbits about themselves with their family and friends. With all their specials done, Morgan, Jerrod and their guests hit the dance floor! They were laughing and celebrating with everyone important in their life-surrounded by so much love! The perfect way to spend your wedding day! Thank you for having share your wedding day! It was a beautiful summer night spent in the most magical way! Seeing the way you gazed at each other from across the aisle, the field, the dance floor and everything in between gave us such a positive sense of what love looks like. We wish you the best in your life together!